OneShar.es is an application with which you will be able to destroy all the private information that it isn't convenient to be read more than once. 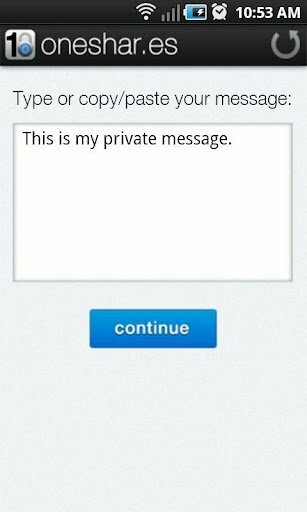 In other words, OneShar.es for Android will allow you to send private self-destructible messages. With this tool it becomes much more secure to send confidential information with data about bank accounts, passwords and any other sensitive information for which mail accounts aren't always secure. With OneShar.es you will be able to send the information straight to your email tray, using the mobile phone's default application, and once it has been read it will be deleted. For this purpose, it uses encryption by means of HTTPS protocol. 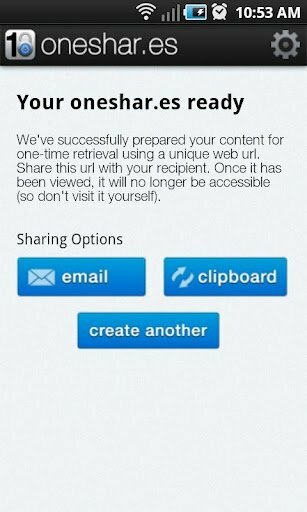 Download OneShar.es and protect your confidential information.